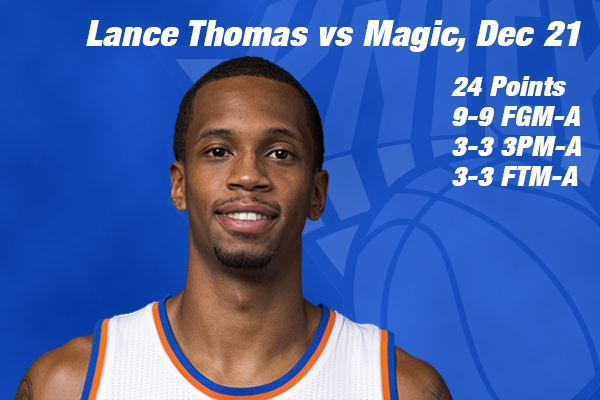 Lance Thomas scored a season high 24 points, shooting 100% from all around the court but the Knicks’ defense wasn’t at the same level, allowing the Orlando Magic to outscore New York 107-99. The Knicks were the better rebounders and they dished more assists but they also turned the ball over 15 times. They missed many opportunities to take the lead but they never took it. Carmelo Anthony who scored 23 points and had 6 assists injured his ankle against teammate Robin Lopez who accidentally kicked him late in the third quarter and is now probable for Wednesday’s game against Lebron’s Cavaliers. Kristaps Porzingis continued to struggle with his shooting and finished the night with 9 points and 8 rebounds. He spent most of the 4th quarter on the bench in spite of getting chants from the crowd but coach Derek Fisher later explained that the decision of who to take out of the game was between Porzingis and Thomas; physically he trusted more Lopez to go against Nikola Vucevic. The Magic center scored 26 points while shooting 13-19 from the field and there was nothing Lopez could do to stop him. Fellow rookie Jerian Grant received 14 minutes of playtime and scored 6 points.